Guess his holiday shows are back on the East Coast this year then! yeah the other poster just has 4. not 5. I wonder what this tour is gonna be like. Tim is no longer in Good Old War and they're normally his backing band so how does this work? Or will Anthony go straight acoustic? I'd love to see that, since all 4 times I've seen him it was with full backing band. 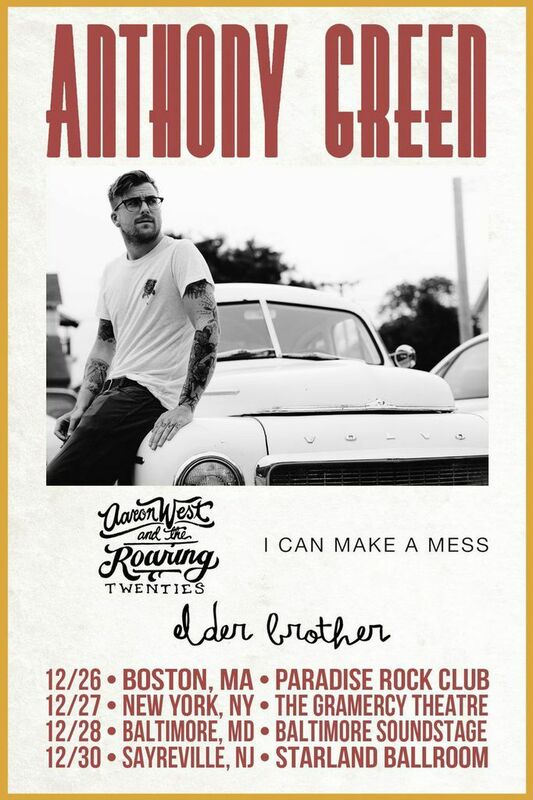 And I love me some stripped down acoustic Anthony Green. he might go straight acoustic. he mentioned something in an artcle about maybe more strictly solo stuff. AG: I’m not 100 percent sure what the future of my solo music is going to be, but the music I’m working on right now is very minimalist compared to Young Legs and Beautiful Things. There isn’t a great amount of instrumentation; it’s really just an acoustic guitar or a single piano and lots of vocals. So I wasn’t really sure if I was going to have a band play with me on this record. If I was to tour again with a full band, it might be time to change it up. It might be time to add or subtract people. I love Tim Arnold so much from the bottom of my heart, and I want to continue to play music with him. I would love to do another solo tour where I have some of the guys from Good Old War and Tim Arnold in the band still, but I just don’t know how it looks yet. I’ve been so tunnel visioned on Circa, and I even have other projects that are pretty intense going on kind of simultaneously; I’d love to do something with Saosin after the Circa record. So that’s, like, a year or two down the line. I’m not really thinking of anything but Circa at the moment, but I do have a bunch of solo songs that I’m working on while I’m doing this, and I just don’t hear a full band vision with most of them. Tim Arnold and I will for sure continue to work together, though. Whether it’s solo or we’re talking about doing a full length High and Driving record, just him and me. We’ll figure it out. when anthony played coachella earlier this year they had the touring drummer of fun play drums. also the dear hunter could be an option. Awesome. I bought 2 tickets for the starland show this morning. Ready for some acoustic. The starland show was great but it made me miss Good Old War. When they're up there with Anthony, the energy is just too good. Without them it was a pretty chill show.